Have a question about Procerebro Forte? What is it, what does it do, how and when to use or something else? Ask us. This product gives you the mental energy o need everyday. And gives you a better night sleep as well. Highly recommended. 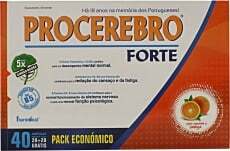 Procerebro Forte 20 Drinkable Vials is a discontinued product. Please browse other products you might be interested in..
Take 1 vial per day, preferably at breakfast and can be diluted in half a glass of water or juice. The first 10 days take 1 vial in the morning and at lunch.